It’s incredible to come across artwork inspired by your own in other parts of the world. A few months ago while browsing online, I stumbled upon what I at first thought was an altered image of a painting of mine from a few years ago i.e. La trascendencia. On closer inspection I noticed that it was almost an exact copy of my original design with some changes. Curious, I traced the image to a graffiti art business page on the Russian social media website VKontakte. The post from February this year was in Russian and posted by a company called Byvt. Using Google Translate I learned that they are based in Moscow, specialise in graffiti art and murals throughout Russia, and have also begun working in the Ukraine and Belarus. They employ over 500 artists. Made on a canvas of interesting jobs . 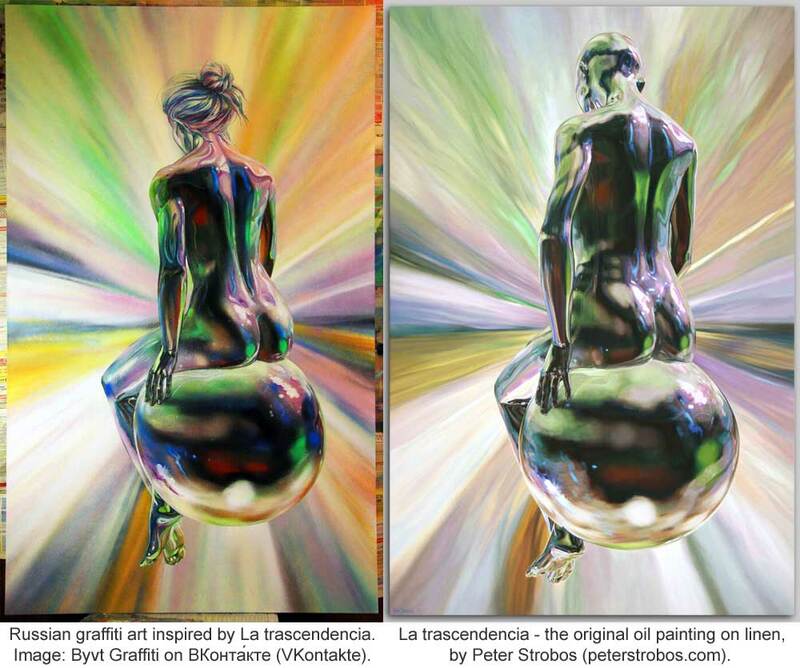 There the artist Peter Strobos, he has a picture of “the transcendence”. In the original man, and we were asked to draw a woman . That’s what came out of it. I have put their version alongside the original painting for comparison. The original is of a woman, but clearly looks too masculine for their client. Anyhow, I think the artist has done a damn good job of it! I also like that they mentioned me and included an image of the original painting in their post.